As of February, we've lived in our townhouse for 3 years. Mason took his first steps here and this is where we hosted his first birthday. We've loved, laughed, dreamed, accomplished and lived here for 3 years, but for some reason it's never really felt like home. Over the years, I've painted a couple of the rooms, gotten a few different furniture pieces from various sources, but it's still not quite right. I don't feel happy and relieved when I walk in the door, and sometimes it feels like I'm living in someone else's house. The décor just isn't right for me, and the furniture isn't as functional as I would like. So, with all of that said I have decided that this Spring and Summer will be dedicated to making over our townhouse! 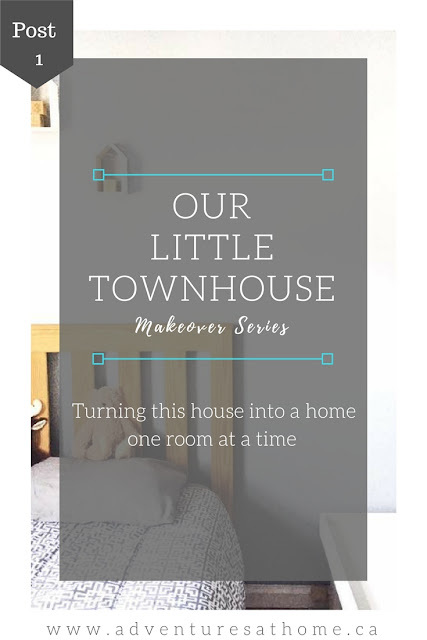 Naturally as bloggers do, I want to share all of this with you guys as we go along, thus the "Our Little Townhouse" makeover series was born! I'll talk about my plans for each room more in depth in another post, but I just wanted to run by my initial plans in this post. Brighten Up Every Room- I know, it's super cliché for a blogger to have a stark white house, but I want to white out pretty much every room. I loved whites and greys before Pinterest even told me I had to. We don't have many big windows to bring in natural light, so painting the rooms white will add much needed brightness. Minimize- I want to get rid of clutter and décor that we don't like or use. I have cupboards full of old candles, etc that need to be cleared out to make way for beautiful décor that we would enjoy more. You will be seeing some posts and YouTube videos coming up with regards to decluttering. Rearrange- Some of our furniture placement just doesn't work or make sense, so I'm going to evaluate each room and decide the best places to put things. I will also make decisions based on the functionality of each piece of furniture to decide which pieces should stay or go, and what new pieces we should bring in. Create A Cohesive Theme- Our townhouse layout is very choppy. We have 4 half floors and a basement with 2 levels. Because of the choppiness of it, I want every room to flow together cohesively. I plan to do this by choosing a similar color scheme for each room. I'm really loving the bright simplicity of Scandinavian style, but I want to add a coastal vibe to tie in our love of the ocean- we are maritimers after all! Get Rid Of Toxic Chemicals And Replace Them With Natural Alternatives- This makeover isn't just about looks. I want to begin getting rid of the toxic chemicals in our home and replace them with natural alternatives. This includes household cleaners, soaps, beauty supplies, etc. I want to showcase local businesses and bring attention to the amazing stores we have right here in New Brunswick! I already have a few Fredericton businesses on board and I can not wait to show everyone what they have to offer! If you're a local business who's style fits in with my vision of Scandinavian/coastal style, OR you offer all natural products that you think I should check out- let's collaborate! Your products could be featured in the final stylized "after" photos of our little makeover as well as on my social media accounts. Your name, shop name, location and links to your website & social media will be listed along with the blog post, and your shop will be tagged in all social media posts. Email me at dedreannadrost@gmail.com or message me on social media if interested! I have a handy little PDF with more details available to send you at a moments notice. I can't wait to get started on this series, and I'll update you all with information on the first project as soon as possible!